So I have been restoring a 1976 GL 1000 for some time now, and as of last weekend finally got it road worthy. With my first ride on it Sunday. I have air shocks on it, which if I understand the prior owner where installed by honda with the bike dang near new. So if it was not an option in 76, within a few years of it. The air shocks have the plastic 1/8 inch line which goto a "T" and then a single line goes to the shrader valve where I can fill them up. I have pulled the lines apart and replaced the rubber ring and reassembled to ensure at least those are not leaking. The bike does loose air some over time which causes it to settle down. And as such I would like to add a On-Board Air supply. My current though is two 20oz CO2 canisters hidden in the Vetter fairing, with a Aspencade (spelling??) air supply toggle switch installed in the fairing between the CO2 tank, the shocks, and a dump line. And a air pressure gauge to monitor the system pressure. I know there is a full electric compressor option, but I have heard from many that the magneto in the early GL's is not very strong and that I should avoid adding a bunch of electrical demand on the bike. Has anyone done anything like what I am considering? As a Jeep owner, I am aware of the company PowerTanks and contacted them for some options. 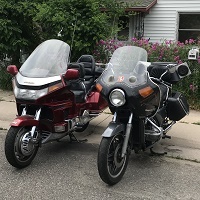 They were a wealth of information, they are not a Goldwing shop but probably who I will buy from if I move forward with this. An air supply pump would not run continuously, just occasionally. So I would not expect it to cause any problems. Replacing all incandescent bulbs with LED would compensate. And if you have not yet updated to a newer Mofset voltage regulator that too helps. Keep in mind the main charging issue is the 40 yr old charging system, not so much the draw of an air pump. I hear what your saying. But still think I am going to continue down the path of avoiding adding additional load with a air pump on the electrical system and look for information from those how have used CO2. Currently the bike is so clean that the wiring harness looks as good as the day Honda installed it. With no wires out of place. 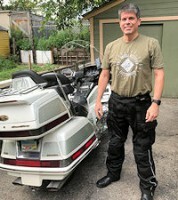 The bike has sat for the last 25 yrs and has under 30K miles on it. So i am not making much in the way of changes such as Mofset voltage regulator or updated magneto. Unless its plug-n-play. I will be moving all the running lights, headlight, and brake light to LED with hopes of lowering the load on charging system. And leaving the turns signals as the original bulbs due to the blinker compatibility issues. Do intend on installing some form of LED driving lights as well. BTW, it's a stator, not a magneto. Would be interesting to try and the run bike with a magneto. So from what I have read, there is no plug-n-play LED turn indicator bulb as the resistance is too low to trigger the flasher. And any bulb with the resistance to trigger the flasher is not reducing the electrical load on the system. So the only benefit to those is the LED light look. And from what I can find, there is no direct plug-in flasher with out adding additional wires and or cutting the plug and changing the plug. Uhm, you also change out the flasher. There's really no need to do anything else if you get the proper bulbs/flasher. The front blinkers are running lights so those go to LED. The rear blinkers only blink when turning so those stay incandescent and set the load so no issue with the blinkers. All the dash lights become 1SMD LED and are brighter and way less power. The Mofset from a 2006 CBR600 was wire for wire identical to your 1976and my 1977 so I only had to reuse the plastic body for thr connector. No wiring mod at all. Thank you for the information. I will be working on updating the charging and lighting next on the bike and will be sure to look into the info provided. I would like to pull this thread back on topic. And from the lack of responses, it appears that going the route of using CO2 has not be considered before. I will continue my research, create a plan, setup on bike, and document it here. Probably have to be during the summer. Where is this Mofset located? Can you please explain more as I have no clue as to what you are talking about. All I know is what a mofest looks like. I wonder if it's even legal. It is a compressed gas in a metal canister. If there was a crash, could it turn into a grenade? So that was brought up by Power Tank, to their knowledge that legally I could not have the system live (aka valves turned on) while driving. Jeep owners have them attached to the roll cage most times by the fire extinguisher. And just use them as a compressed air sources for tires. They also have the attached as a Fixed unit to the ARB dif lockers. The larger more fixed systems are also used to supply air to Air Tools for trail repairs. As they are sold as an accessory used in something as mainstream as wheeling, I dont see having it on the bike as a problem. And if I want to use it in a more fixed fashion, that is something I have to decide how to implement. As far as the grenade aspect, given the wheeling community and the abuse those rigs go thru, have to believe that aspect has been considered and they are used in those extreme conditions as they are a safe option. These are the same tanks used in paintball and air-soft guns and have to meet the highest safety regulations. The big question in my mind is how to implement. I could just do something as simple as using it as a compressed air source and get off the bike and change the shock pressure as needed using the existing system. I could go completely complex with adding a pressure switch an gauge to be able to change the suspension on the road in real time. You would most certainly need to incorporate a pressure regulator off the CO2 canister, get the pressure down to 75 PSI or so, I doubt electric valves could handle direct pressure of the canister, and you would also run the risk of severely overpressuring your shocks. The kit i am looking at is sold with a pressure regulator to take it down to 25psi from the 3000psi the canister is capable of handling. Normally its filled to 1800psi. The version I am looking at is called "The Jet Pack System for Air Lockers" and its $400 for two 20oz tanks, and regulator. And I was wrong about the minimal psi above, the the 160 psi max kit goes down to 50psi. No answer to my ?? Did I miss another question? Sorry for the late reply, its deployment time and work and its keeping me busy. No, someone mentioned a Mofset . I asked what it was, where it was, etc. This happens often, people post, you ask a followup and they either move on or just ignore you. I am guessing its some form of higher efficient voltage regulator vs my GL1000 original. And he provided a bike model which he pulled it from. Something I will look for more of a How-To doc to follow and consider doing the same. So far I have gotten 50 miles on my bike since getting it road worthy. And this is the first 50 miles I have ever put on the bike. Pretty stoked about how its riding so far. Though I do see where there are some improvements I want to make in the lighting to improve viability. But that is for another thread. A MOSFET is a type of transistor that is efficient at handling large current. Regulators made with MOSFETs handle the large amounts of power generated and regulate it better, losing less power as heat. So it's not something you add, it's an integral part of something you add. Be interesting to know if that 2006 CBR600 regulator is a shunt or series regulator. The difference being a shunt regulator (like on the 4 cylinder wings) "shunts" (grounds out) varying amounts of current from the stator depending on draw from the bike and battery in order to maintain correct voltage. The stator is always running at full output for the RPMs and the AC voltage at the stator is pulled down around 15 VAC due to the combined load of bike, battery and shunt regulator. Current not needed by the bike and battery is sent directly to ground. 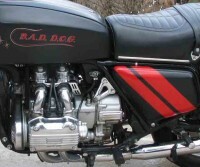 A series regulator does not "ground out" excess current, instead it only "passes" thru to the bike and battery enough current to maintain correct voltage, so the stator is rarely running at full output current and the AC voltage at the stator can vary from 15-50 VAC depending on RPMs and combined bike/battery load. A series regulator can be easier on the stator since it is not always putting out full current, but the voltages in the stator will be considerably higher increasing the chances of insulation breakdown. Right. You can buy a voltage regulator unit that internally uses MOSFETs. I still have the stock VR on the bike never saw the need to switch but I would if there was a benefit to it.